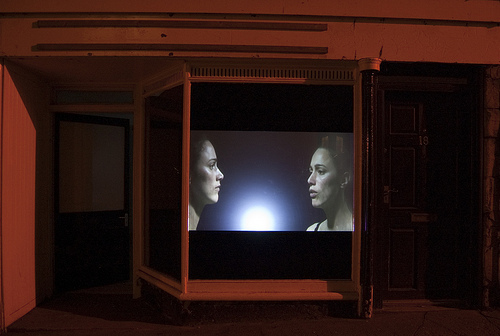 Streetview Photograph of Inspirare installation, Cupar Arts Festival, Octobber 2009. Backlit video projection onto Frosted Glass in empty shop. Inspirare, a short film by Owen Daily from owen daily on Vimeo. 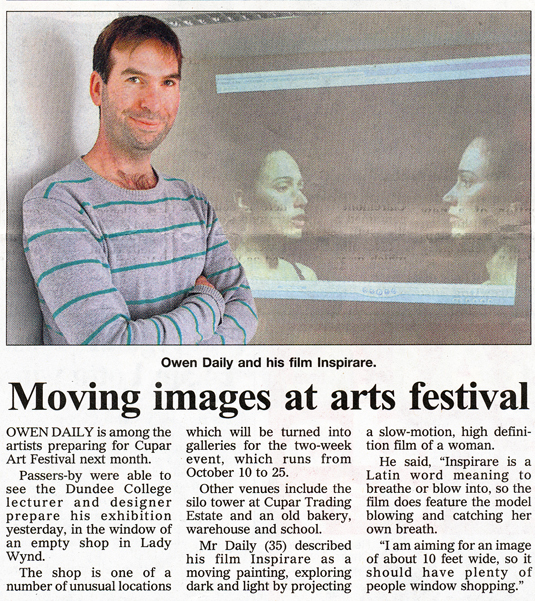 Photograph shows the Video Installation as part of the Cupar Arts Festival 2009. The video is back-projected onto the window, from inside the vacant shop. "Frosted glass" film was applied and framed with black vinyl top and bottom. The window dimensions are 141cm wide x 170cm tall. Conceptually, the film takes the breath as it's starting point to explore artistic inspiration and its intangible and elusive nature. It was designed and shown in a shop window as part of the Cupar Arts Festival 2009 and was on every evening throughout the duration of the show. I believe this piece would successfully fit with BolteLang gallery's interest in the "promise of the unattainable". The film runs on an loop - reinforcing the unattainable and unresolved state of the subject. The model is Swiss artist, Nadine Habertheur, (born Basel 1975), now living and working in Edinburgh, UK. It can be shown either as a single screen image or divided over two monitors, with one head in each monitor.